Step back in time and experience the authenticity of the period. The cottages lovingly restored with modern touches, and precious pieces, which each have a story, are fascinating. Die Tuishuise & Victoria Manor in Cradock in the Eastern Cape is an elegant collection of beautifully restored Victorian era craftsmen’s houses in the frontier town at the eastern edge of the Great Karoo of South Africa. More than two dozen Tuishuise line Market Street up to the Victoria Manor, a grand old colonial hotel that welcomes you with hearty country fare and décor from the days of Cecil John Rhodes, Olive Schreiner and the droves of adventurers who passed here en route to the hinterland. Modern day over-landers crossing South Africa on holiday and business groups looking for inspiration stay at Die Tuishuise, where they are received like old friends and treated like gentry. Dinner is served in the Manor House on the corner of the street. Enjoy a pre-dinner sherry before sampling the delicious array of Karoo food. 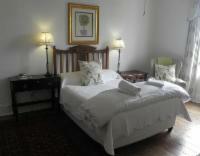 Dining at the Victoria Manor is a country affair, an indulgence of superb traditional Karoo and South African cuisine. Special occasions, such as weddings and celebration teas are also catered for. "We had a most enjoyable stay at Die Tuishuise and found, as on previous occasions, the accommodation and food excellent and the staff very pleasant and helpful "
"A very great neat place with a real burning chimney"
"The dinner was delicious, and the pub is so cozy. It was a wonderful experience." "A step back in time with a bit of nostalgia. Excellent food and courteous and helpful staff. A very comfortable place to stay." "Excellent stay and good service, food excellent. We will definitely visit again." "A very pleasant stop over at this establishment. Spacious, clean and good food and good service." "A feeling of nostalgia swept over me as I entered my residence for the week. I was privileged enough to know my great granny and the house I stayed in reminded me so much of that time. The management and staff really went out of their way to make me comfortable and welcome in their town. I arrived a stranger and left knowing that I can come back to visit with friends. The service was excellent and the friendliness of the staff contributed to a very memorable week. Thank you"